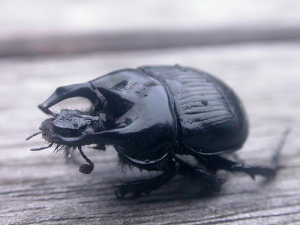 Observation - Minotaur Beetle - UK and Ireland. Description: Found on the iSpot Waders & Wildfowl Workshop at Arne RSPB reserve in Dorset. I thought it was dead at first, then I noticed its antennae moving a little. Found on the iSpot Waders & Wildfowl Workshop at Arne RSPB reserve in Dorset. I thought it was dead at first, then I noticed its antennae moving a little.